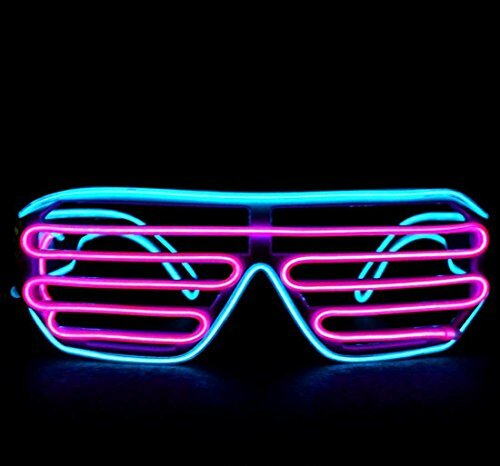 Unleash the light with these stunning Cyan and Pink EL wire wrapped Luminescence Glasses. Our shutter design is careully lined with illuminated luminescent wire. Our all new dual two-tone color shutter frames combine your favorite colors into one perfect pair of multi-color light up glasses. Let our glasses match your attitude. These EL wire glasses are illuminated and battery powered to light up the night. They are the perfect addition to any outfit and great for any party. The multiple modes and colors feature solid on, flashing, or the all-new sound activation mode. This is the first product to have a 3-mode function, and sound activation all in one! The sound activated mode can be set to go with the beat of the music at any distance or pace. Enjoy a lightshow to any BPM of your favorite EDM music with these awesome LED style EL glasses. Don’t hesitate and start impressing all your friends today! It is cool and attractive and give your life more interesting. Fashion and Flashing can make you look amazing. Portable and light up glasses make you look cool around the dancing poor. Glasses come with a clear frame and clear lens. Our 3-mode battery pack uses 2AA batteries,Steady on/Slow flash/Fast flash offer you different feeling. The battery pack can be put inside your pocket or clipped to your pants/shorts.